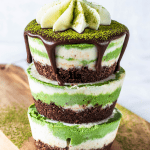 Check out my Vegan Matcha Cheesecake. This zebra cheesecake is also paleo*, gluten-free, refined sugar free. Let’s get it! 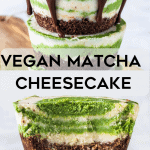 This Vegan Matcha Cheesecake is super easy to make. I made them into mini cheesecakes, cause they are cute. 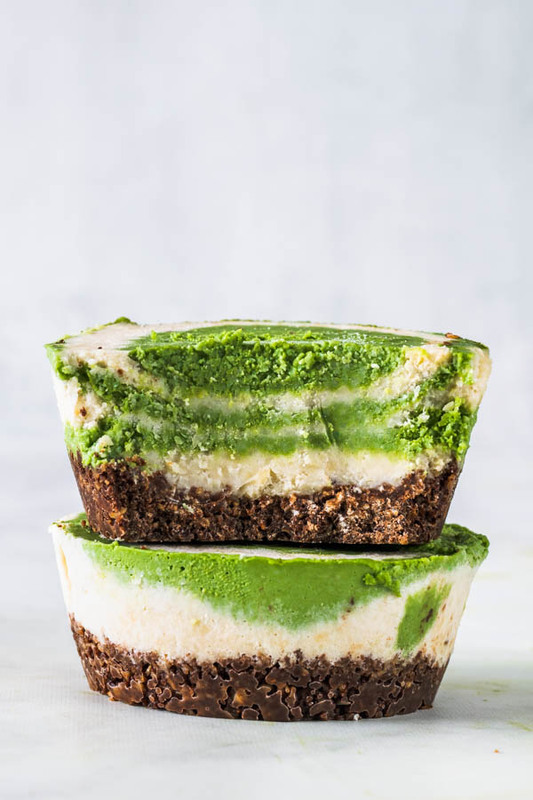 And I just know you are dying to see the inside of these Vegan Matcha Cheesecakes, aren’t you? How beautiful are these zebra cheesecakes!! I hope I’m not the only one that thinks so. Anyway, now let’s get to the how-tos. So, for this recipe you might need to make some stuff ahead such as soak your cashews, and make the ganache, so it has a chance to come to room temperature before you pipe it over the matcha cheesecakes. But it is a pretty easy and straight forward recipe to make. We can start with our fabulous crust. The crust of our Vegan Matcha Cheesecake is a simple vegan roll out chocolate cookie. After you roll it out, cut circles that will be the same size as the diameter of the bottom of the pan you are planning to use. 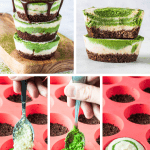 When I made my vegan matcha cheesecakes, I actually used two different pans as you will notice with my pictures. 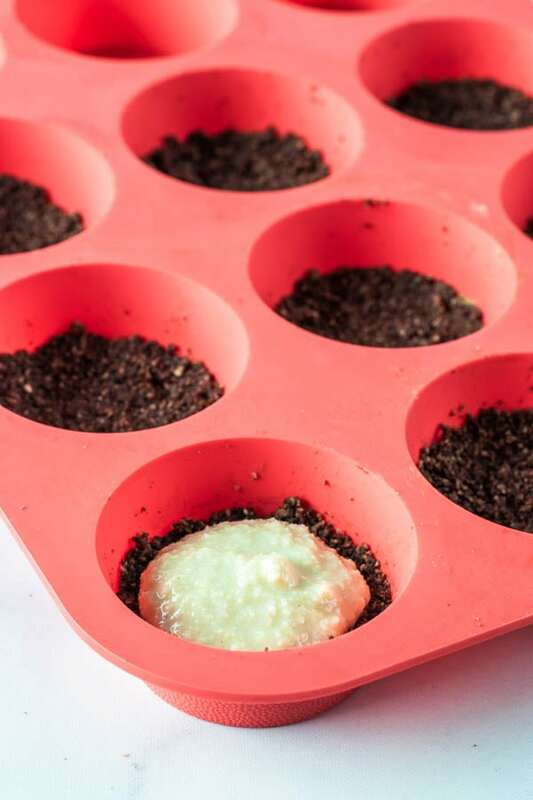 I used this silicone pan (yes, it really is $0.99) and some regular silicone muffin pans, like this one. After you bake the bottom crust, you can let it cool while you make the cheesecake. 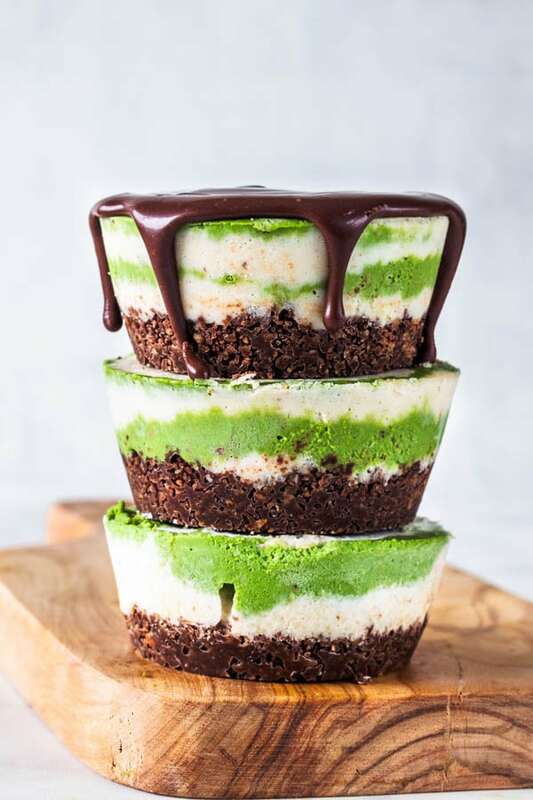 You will end up with two batters, to make the effect of the Vegan Matcha zebra cheesecake. Star by spooning some of the white batter on the bottom of the pan. Then, right in the middle, on top of it, spoon some of the green vegan matcha cheesecake batter. 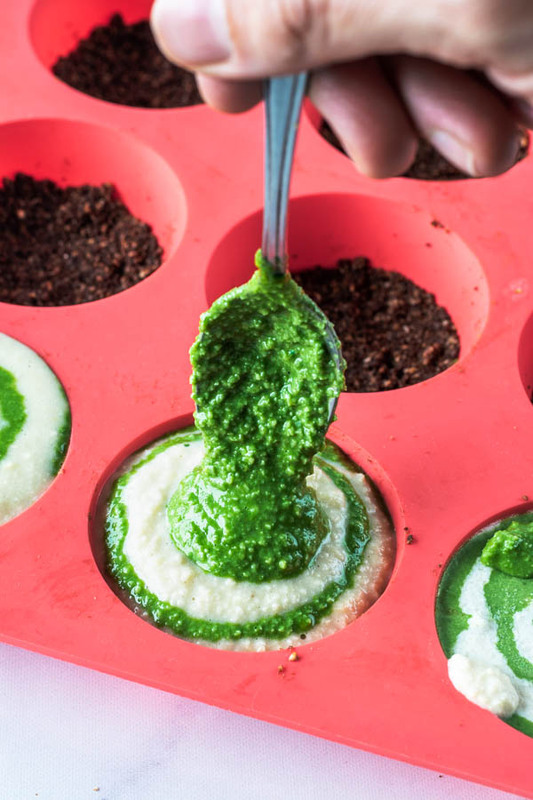 Now, spoon some of the white batter on top of the green, right in the center. And you are going to keep doing that until you reach the top of the pan, always alternating between the two batters. That’s it! So easy, right!? 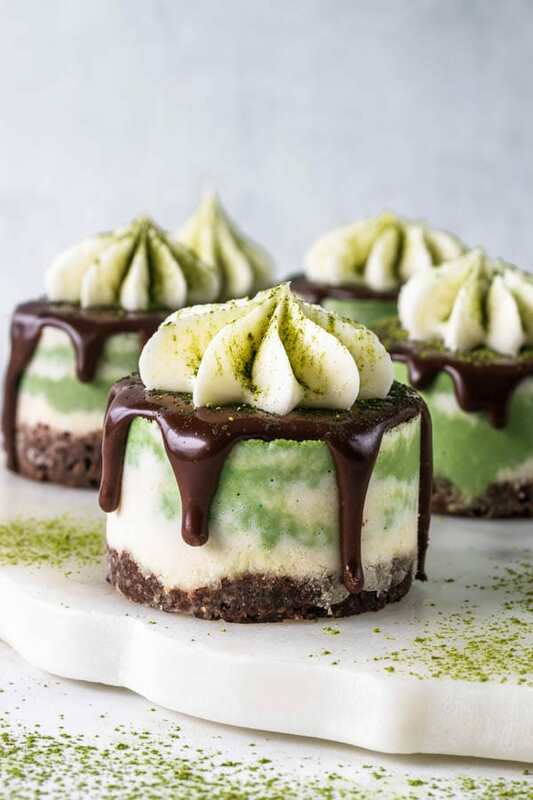 Now leave your Vegan Matcha Cheesecakes in the freezer overnight to set and get really creamy and delicious. So this is the other pan I used for the cheesecakes. It just made a different final shape. Check it out. I did prefer the ones in the muffin pan, they were prettier, and they came out a bit bigger too, so more cheesecake per serving! Yay! 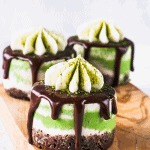 You can also make this recipe for the Vegan Matcha Cheesecake using a big spring form pan. Follow the same instructions, but with just one bigger pan instead of all the small ones. I tend to like mini desserts, specially if they are mini vegan cheesecakes. My favorites! Like my Vegan Strawberry Cheesecake. And I still can’t get over that perfect zebra effect on my Vegan Matcha Cheesecake! I ate one before glazing with the chocolate, just to see if it would taste better with or without the ganache on top. Verdict: everything in life tastes better with chocolate in it, but still tasted pretty awesome. To pipe the ganache, or spoon it on top of your cheesecake, first make sure the vegan ganache is at room temperature. If the ganache is hot, it will be too thin and runny and won’t create a drip effect on your cheesecake. 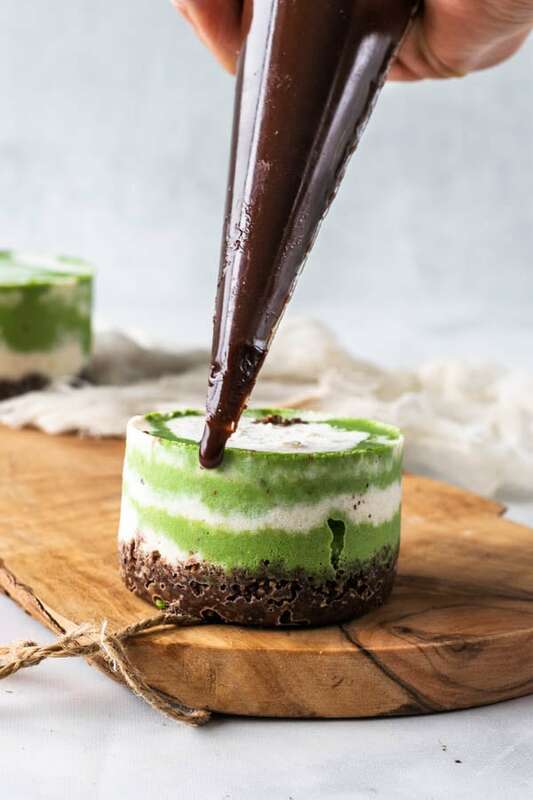 You can either use a spoon, and pour some of the vegan ganache over the zebra matcha cheesecakes and then let it drip down the sides. Or you can use a piping bag, pipe the ganache all the way around the edges of the cheesecake, and then pipe some on top, which is what I did. Now, let’s talk about the coconut whipped cream on top. Please make sure your coconut cream was refrigerated overnight or for a few hours, at least. It will make it much easier to whip the cream into a beautiful consistency. If you leave your can of coconut cream in the fridge overnight, the next day, simply turn it over when you open the can, all the water will be on the top, and you’ll be able to just drain it all out. This way, you will end up with the full fat coconut creamy goodness you need. 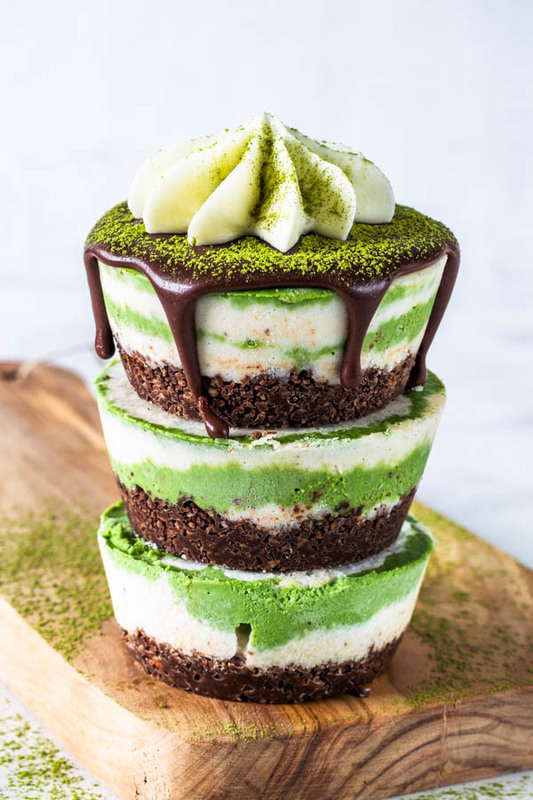 If you are going to sprinkle matcha over your Vegan Matcha Cheesecakes, make sure to do so right before serving, because the matcha powder will lose its beautiful green color very quickly. I hope you liked today’s vegan recipe. Don’t forget it is also paleo*! I adore making vegan and paleo treats and desserts. If you want to check out more of my paleo/vegan baking, click here. My trending ones at the moment are: Pecan Brownie Vegan Pie, Fig and Pistachio Vegan Cheesecake, and Vegan Cookie Dough Bars, and I have many more for you to enjoy. Thank you so much for reading my blog and supporting me! 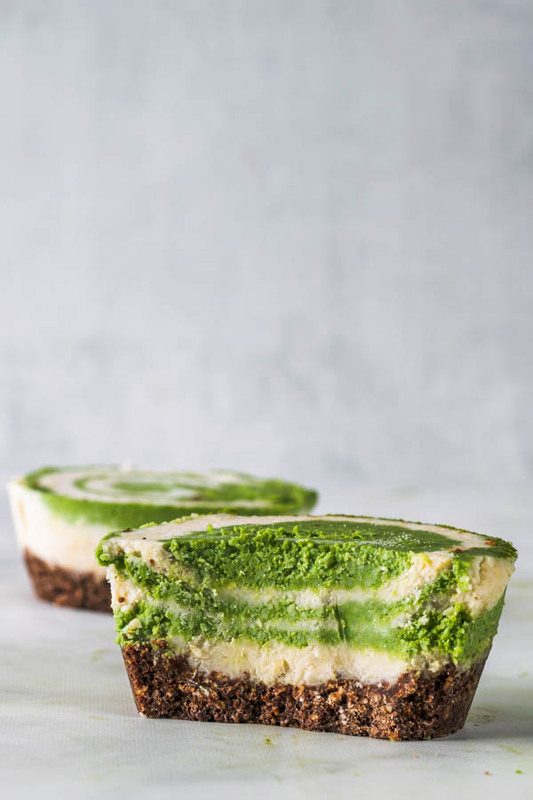 *As specified below in the recipe, this Vegan Matcha Cheesecake will also be Paleo if you substitute the oat flour in the cookie base recipe for almond flour instead. 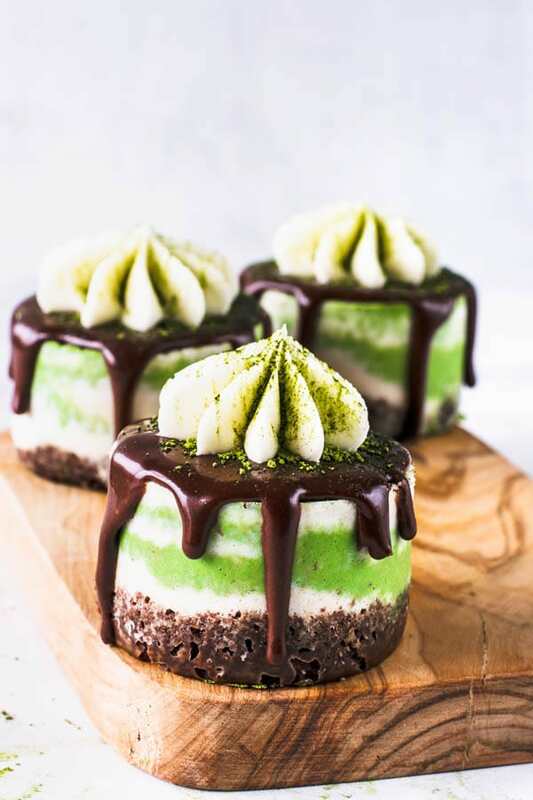 Vegan Matcha Zebra Cheesecake. Also paleo and gluten-free. Decorated with ganache, and coconut whipped cream. Made into mini cheesecakes. Mix all ingredients together in a bowl. Mixture will become a wet dough. Wrap it and put it in the fridge to rest for 30 minutes. Remove dough from the fridge and cut it in half, to make it easier to handle. 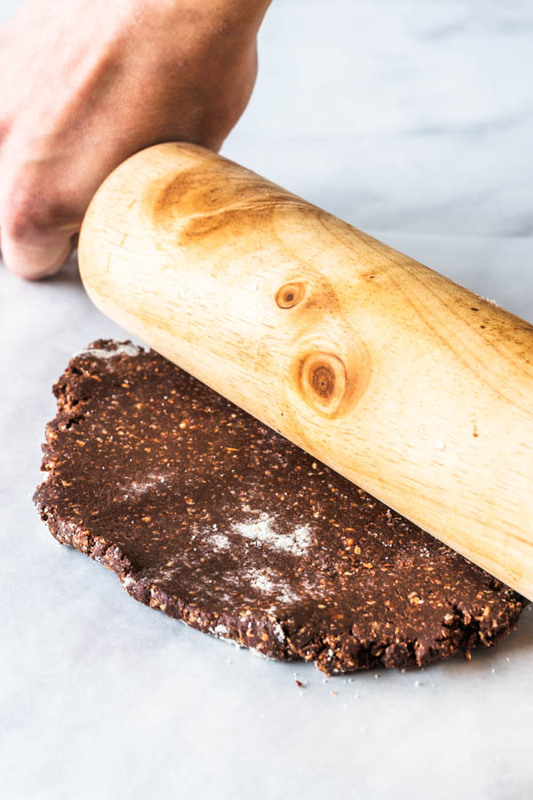 You can use a bit of almond flour to dust the counter so the dough doesn’t stick, or roll the dough out over a silicone mat, or some wax paper. Roll it to about 1/2 inch thick. Cut circles that will be the same diameter as the bottom of the pan you will use. If using a large cheesecake pan, you can just roll out the entire dough and press it onto the bottom of the pan. Line bottom of the pans with the dough. Place pans with the dough in the fridge or freezer while you wait for the oven to heat, this way, the fat in the cookie dough will be solid before entering the oven. 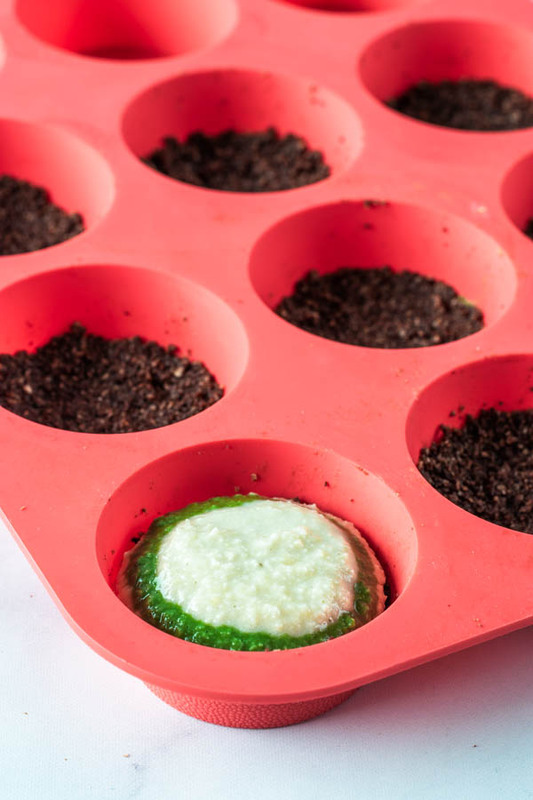 Now, you can bake the crust. For smaller pans, you will need less time, anywhere from 5-10 minutes. For a large pan you might need up to 15 minutes to bake it. You also don’t want to overbake it and end up with a hard bottom for your cheesecake. Bake until just set, which shouldn’t take long at all. Remove from the oven, set aside to cool. Start the night before, or a few hours prior. If starting the night before, simply soak the cashews in some room temperature water and let them sit on the counter soaking overnight. If starting a few hours before, soak cashews in hot water for at least 1 hour. 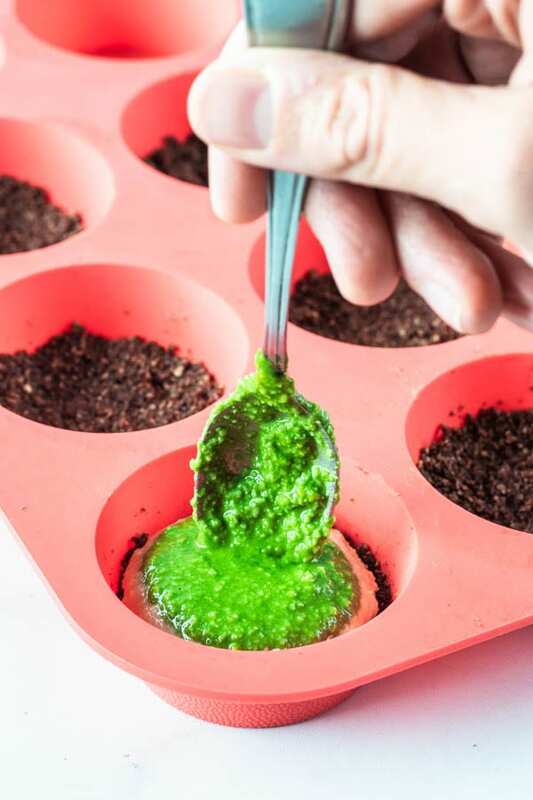 Place all ingredients except for the matcha powder in a food processor. Process for a few minutes. I like my cheesecake very creamy so I process mine for about 4 minutes. It will depend on how powerful your food processor is. You might want to scrape the bowl of the food processor in between blending. Now, divide the cheesecake batter in two. Leave the other half of the batter in the food processor and add the matcha powder to it. Process until combined. Spoon some of the white cheesecake batter on the bottom of the crust. 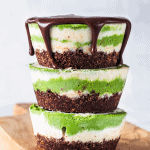 Right on top of it, in the middle, spoon some of the green matcha cheesecake batter. Now repeat, alternating colors until you reach the top of the pan. You can use the pictures in the post above as reference. Tap the pans against the counter to even out and smooth the top of the cheesecakes. To make the ganache, simply heat the coconut milk until almost a boil. Pour over chocolate chips. Stir until everything is melted. If necessary, place it in the microwave at 5 second intervals until all the chocolate is melted, and the ganache is smooth. If ganache is grainy and separating, you can add a teaspoon of coconut oil to it, to try to smooth it out. Let ganache come to room temperature before spooning or piping over cheesecakes. Right before serving, whip the coconut cream with a mixer until stiff peaks form. Make sure your coconut cream is very cold from the fridge. After spooning the ganache over the cheesecake, let it set in the freezer. When solid, you can pipe the coconut whipped cream over it. Sprinkle some matcha right before serving. Cheesecake will keep in the freezer for up to 1 week. Sempre uma receita melhor que a outra, parabéns Ca!!!!!! Another glorious creation! Your family must love getting to eat all of these beautiful sweets! what size springform pan should I use? If you are using a large springform pan it will probably fit in a 9″. 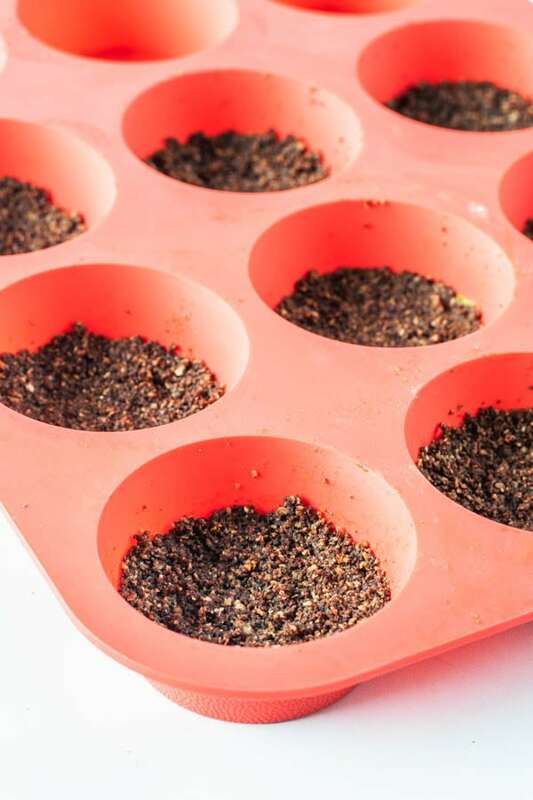 I made it using small pans, but I would try it with a 9″ one if I were to use a large pan.